We arrived in New Zealand on Saturday night. Just over two and a bit hours away from Sydney and our globe-trotting adventures could continue. Although we had booked the tickets just a matter of a few days ago, we found ourselves in the fortunate position of not only securing a lift from the airport but also accommodation, both of these courtesy of a man named Ted. We met Ted and Barbara on a previous holiday in Turkey, and as ever we kept a diary of the trip. The Turkey group were a great bunch, and some had said that we should stay in touch (I always try to anyway), adding that "if you're ever over in this part of the world do call in ...". Ted and Barbara were one such couple, and just one day after emailing them to say that we'd be over to NZ, I got a call from Barbara saying that Ted would be waiting for us at arrivals and we'd have somewhere to stay for the night - how could we argue with that? Yesterday we spent at the house just chilling out, playing with the neighbour's cat, Zorro, who seems to have taken up residence with Ted and Barbara (from here on in referred to as T&B!). Like grandchildren whom you can hand back to the parents at the end of the day/weekend, T&B get the best deal here - the cat comes around, plays, has a fuss made of him but doesn't need to be fed by them and when there are vet bills to take care of, well, that's the owner's responsibility. Strangely, I warmed to this cat (yep, I'm a dog person through and through) because he didn't feel the need every 5 seconds to get his claws out and shred my feet and was happily playing with a ball (a rolled up piece of paper, we improvised) as if he were a dog. We made it into the city today, though. Ted kindly dropped us right in the centre saying that he had a few things to do. As we got out I asked what he had to do, expecting that these tasks involved going somewhere or picking something up (this was how he justified dropping us in), but he responded: "Oh, I've gotta make a few calls, do some paperwork." He didn't need to go anywhere near town, so it was very kind of him to take us in. Sign seen on Victoria Street outside a bar. Truth be known, there is not an awful lot to do in the centre of Auckland, other than visit the Sky Tower or do a bit of shopping. And that's essentially all we did. 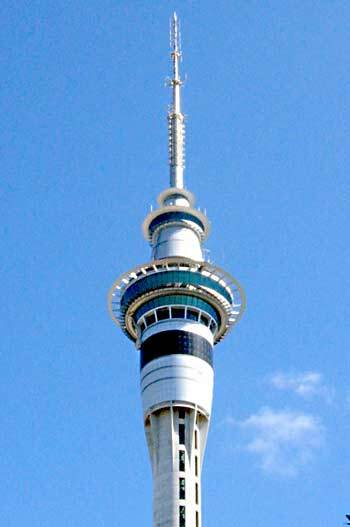 Auckland's stupendously tall Sky Tower. Sky Tower was completed in 1997 and is very much the city's icon, just as Paris, Seattle, Toronto have their own iconic towers. We took the incredibly fast elevators up to the 51st floor - although there are not 51 floors as such, that's just an indication of height - where the main observation level sits 186 metres above the ground. We were lucky with the weather - clear blue skies with just a few whispy clouds ensured clear views for miles all around, and we spent much of the time trying to identify some of Auckland's landmarks. This was no easy task, as we knew so little about the city! From the main observation level you can spend as long as you like taking in the views, looking at the various video clips that show how the tower was built, take control of cameras mounted on the outside of the tower and zoom in on unsuspecting shoppers below who happen to be picking their nose for all to see, or you could just throw yourself off the building for fun. If falling 192 metres down to the streets below attached to a descender fan is your idea of fun (and if you have $NZ195 to burn for the 16 seconds that it'll take you to reach the bottom), the SkyJump could well be your thing. We both skipped on that one, but enjoyed watching others making their way over the ledge and down below at 75 kmh. This place is not for those with a fear of heights. 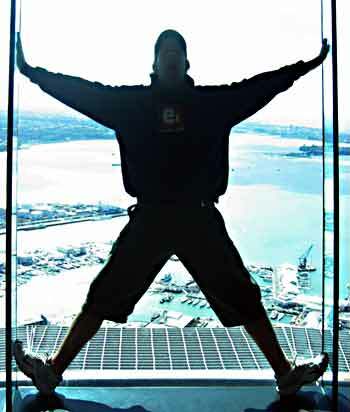 Dotted around the circumference of the tower are various areas of glass flooring. A sign next to them assures that the glass is as strong as concrete - all very good, considering that below that glass is 186 metres of nothing before you reach terra firma. It was entertaining to watch some people walk gingerly around them, clinging on to the hand-rails for dear life, as if the floor might give way at any second and ruin an otherwise perfectly good holiday for the family. 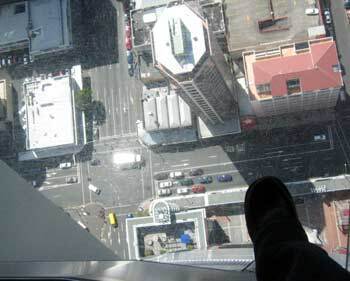 Manda's foot on a glass floor panel in Sky Tower, 186 metres above the streets below. 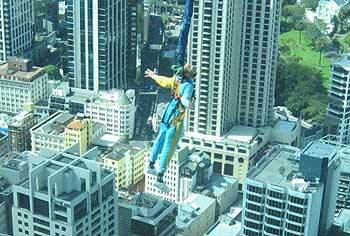 We then paid a further $NZ3 each to go up to the 60th floor (220m), otherwise known as the Sky Deck. Essentially, it's a smaller viewing area with fewer seams between the window panes, but the view across the city is hardly any different. If you were feeling adventurous, you could go higher still - the 'Vertigo' ticket ($NZ145) lets you climb inside the antenna mast right up to 270 metres, after which you make your way back outside on to the crow's nest and on to the highest platform in the southern hemisphere. Insert some 'I'm the king of the world' type caption here. Actually, scrub that idea, it's a crap one. Underneath the Sky Tower is one of the best travel information centres I'd seen in a long time, and I managed to stuff my bag full of leaflets promising all sorts of interesting adventures, but none of them nearby. Like I mentioned, there's not much to do/see in the centre, so we did a little bit of shopping (nothing remotely interesting) then walked along Queen Street toward the ferry terminal, and from there it was back to Half Moon Bay, then by bus back to T&B's place on the Bucklands Beach peninsula. Ted was knocking up a roast dinner, something we'd not had in a while. To say it was welcome would be an understatement (adventurous cooking for us travelling campers involves washing the tin billy between 'dishes' cooked on the portable stove!). However, he looked disappointed when we both passed on the apple pie for dessert. Realising that he couldn't manage the whole 10" diameter pie by himself, Ted reluctantly put the pie back in the freezer, biding his time until such a time as his house guests succumbed.